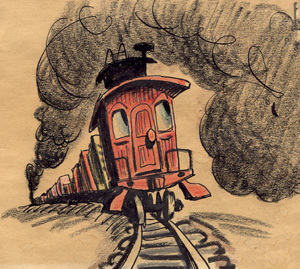 Of it, Peet says: "A drawing of an unhappy caboose rattling along under a cloud of train smoke was stuck on my studio wall for fifteen years before she became 'Katy' in the story 'The Caboose that got Loose'". Do a Google image search for the caboose who got loose, and you'll see many other drawings of the caboose in various attitudes. The line of its "mouth" is either shadow under the back door, or the top of the little platform. Peet often shades mouths very dark, as in some of these monsters. With the caboose, he's doing the same on the lines that have been recruited to represent a mouth. There are lots of nice examples in his book Bill Peet: An Autobigraphy .